Moving and Storage is a $12.6 billion dollar industry that is forecast to grow at least 8% per year over the next decade. * Nationally, one out of six Americans will move this year. All of them will face the decision of selecting a moving company to trust with their most prized possessions. “Will the moving company show up as planned and on time? Will unusual and fragile items be packed and transported properly? Will the origin and destination be prepped and protected from damage? Will the movers be professionally trained, drug-free, and honest?” As a franchise owner of My Guys Moving, you will have the answers to all these concerns. My Guys is committed to making the moving experience as pleasurable and drama-free as possible. In fact, 98% of our customers rate us “EXCELLENT” and say they would recommend My Guys to their friends and family. And that is why over 50% of our moves are either referrals or repeat customers. Our time-tested process shows you how to replicate these results in your market. Overall, people gravitate towards recognized brands because they want consistency and dependable service. Today’s mobile population expects a higher level of service and dependability that most “Mom and Pop” shops or local moving companies tend to offer. My Guys Moving & Storage will show you, our franchise partner, how to meet and surpass these expectations. It's a Great Franchise Opportunity! Friendly and Memorable: Our brand is friendly and memorable. People remember our name and we get the calls. Scalable: You can run the business from home until you have grown it large enough to need commercial space. Recession Proof: When things are good, people move up; when things are bad, people downsize. No matter the economic condition, people move! Simple System: Our efficient business system lets you run the business instead of it running you. Live the Dream! It takes courage to transition from a day job to entrepreneurial freedom... maybe the pride of seeing your trucks around town making the difference in people's lives will help you decide to become One of the Guys! We Are Not Offering Franchises at This Time. 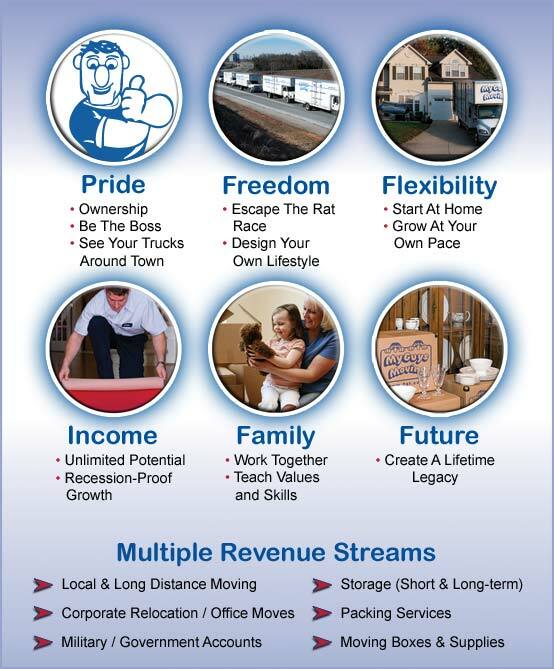 For info on future moving franchise opportunities - Call 703-657-1404. NOTE: We Are Not Offering Franchises at This Time. This website is not a franchise offering. A franchise offering can be made by us only in a state if we are first registered, filed, excluded, exempted or otherwise qualified to offer franchises in that state, and only if we provide you with an appropriate franchise disclosure document. Follow-up or individualized responses to you that involve either effecting or attempting to effect the sale of a franchise will be made only if we are first in compliance with state registration or notice filing requirements, or are covered by an applicable state exclusion or exemption.